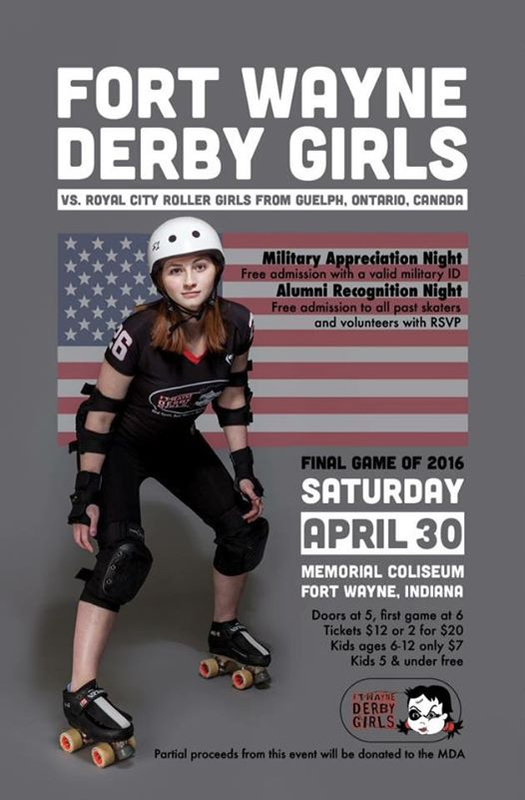 This is your chance to catch the Fort Wayne Derby Girls at their last home bout of the year! Join us Saturday, April 30th at the Allen County War Memorial Coliseum. Doors open at 5pm, and the first bout starts at 6pm sharp. First up, Fort Wayne’s A team, the Bomb Squad, will take on the Royal City All-Stars from Ontario, Canada. After that (around 7:30pm), the Fort Wayne SWAT Team will play Royal City’s B team. Tickets are $12 each or 2 for $20. It’s military appreciation night, so all active military will receive one free ticket when they show a valid military ID! It’s also alumni appreciation night, so all active FWDG alumna will receive two free tickets (you must contact FWDG prior to the game to be placed on the list). Tickets can be purchased at the Coliseum box office, or Ticketmaster.com. Proceeds from this bout will benefit MDA Team Gilbert.